Why hike to Little Nellie Falls? Despite its modest size, Little Nellie shares the quality inherent in waterfalls, nature's margaritas, of unleashing happy-for-no-reason chemicals in your brain and making you look upon the world with a benevolent and satisfied air. Life is good at a waterfall, and this is one waterfall that you have a strong chance of getting all to yourself. 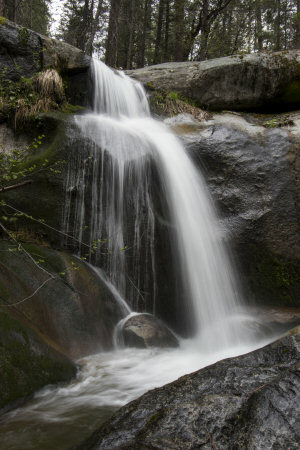 Scenery Summary: Little Nellie Falls, the pride of Little Crane Creek, consists of a roughly 15-foot fall above the trail (pictured here) and some small cascades followed by a shallow pool below it. Few hikers visit Yosemite just to see Little Nellie, but it is a refreshingly tranquil alternative to the crowds of nearby Yosemite Valley. Aside from the waterfall itself, the high point of the journey occurs just after you begin the hike, where you'll have views across the imaginatively named Big Meadow with El Capitan and Half Dome visible in the distance. During spring the hike includes assorted wildflowers, with perhaps the most interesting being Indian Rhubarb, which grows right out of the streambed below the falls. Crowd Factor: Light. Other hikers you encounter are likely to be locals. Difficulty: Low. The trail is wide and fairly smooth (it is, in fact, not a trail but the Old Coulterville Road). It ascends steadily, but generally not steeply, for most of the route to the falls. Best Time to Visit: In the spring, when the water flow and wildflowers are peaking. Figure April or May (wildflowers might be less abundant the first half of April). Parking: The trailhead doesn't have an official parking area - or an official trailhead, really, what with the trail just following the Old Coulterville Road - but a logical place to start is from the small parking area where the road forks at the intersection of the Old Coulterville and Forest Roads, since the former becomes impassable to cars soon afterwards and parking here allows you to walk past Big Meadow instead of straining that lovely bit of scenery through a car window. Here's a street view of the intersection (Old Coulterville Road is the right fork in this view) and another of the parking area just beyond. It's unlikely to be full, but if it is, you can park along the road. Nearest Bathrooms: Pit toilets at Bridalveil Fall, 6.5 miles (10.5 km) to the east. Many visitors can find them blindfolded. Bathrooms with plumbing at Crane Flat (the junction of the Big Oak Flat and Tioga Roads), 8.5 miles (13 km) to the northwest, or in Yosemite Village, 12 miles (19 km) east. Nearest Snacks: At Crane Flat. Food Storage Lockers: None in the area. Pet Friendly? Alas, your dog is not allowed on the Little Nellie Falls trail. Since Little Nellie is just over the park boundary in Stanislaus National Forest, your dog is allowed at the waterfall itself; you just can't take it there. The obvious solution, a doggie jet pack, is not available in the marketplace, a stunning indictment of our so-called "modern" society. You could approach from the other direction without encroaching on national park land - the road continues past the falls and eventually reaches Highway 140 west of El Portal via a meandering route that appears to be about 10 miles (16 km) one way and includes an elevation range of just under 4,000 feet (1,200 meters). I have not tried this myself. It also appears that it might be possible to detour south through Foresta and reach the trail (which, as mentioned elsewhere, is actually the Old Coulterville Road) by car via the western branch of 1st Street and drive to the falls, provided the road's dry and you have good clearance. See the trail map and satellite view to judge for yourself. Getting There: The trailhead is in the Foresta area, a few miles off the Big Oak Flat Road (the road connecting Yosemite Valley to the Tioga Road and the park's northwest exit). Take the Tioga Road/120 turnoff from Highway 140 a bit west of Yosemite Valley (take the right turn in this Google street view, which shows the approach from the valley, albeit from the wrong lane). You'll reach the Foresta turnoff after 3.3 miles (5.3 km) - see a street view of the intersection here. After a few miles on the Foresta Road you'll reach this fork in the Old Coulterville Road. Park here and start hiking along the right fork, which leads you past the south side of Big Meadow before the trail begins climbing. Trail Notes & Hazards: You'll encounter four forks in the trail to the falls. Turn right at the first three, which all occur fairly early in the hike, and stay left for the last one. The first fork is just past Big Meadow and almost within sight of the parking area, right after you cross Crane Creek via a bridge that's closed to automobile traffic (it'll be obvious why once you see it; you'll need to choose your path carefully even when crossing by foot). Turn right here; the left fork is 1st Street. At the next intersection, the left fork will also be 1st Street, which just can't bear to be away from you. But turn right here. The left turn at the third intersection is Flying Spur Road; again, take the right fork. There's a sign here pointing the way to Little Nellie Falls. The last intersection is about two-thirds of the way to the falls, where a smaller side road veers up and away to the right and eventually ends up at Crane Flat Campground. Stick to the main (left) road here. Though the bulk of the hike is in Yosemite, the falls themselves are just outside the park in Stanislaus National Forest. You'll pass signposts marking the park boundary a quarter mile or so before the falls. There's an open area with a picnic table across the creek from the falls, but no bridge, so you'll have to find a rock or log crossing. Or just wade across - it's not a large creek, even in the spring, though of course you should exercise careful judgement if you're there in the wake of once-in-a-century storms, sharknados, etc.